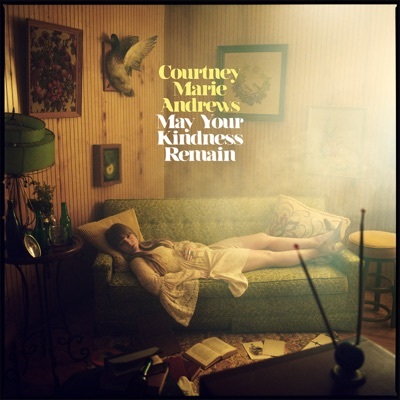 I got to reviewing Courtney Marie Andrews way too late in 2016 - and honestly, for as critical as I was of it, I may have been a little too hard on it as a whole. Part of this is that she was facing some really stiff competition in 2016 that made for apt comparisons - the list of women in country who dropped literate, intensely emotive records that year is considerable and she had an uphill battle. But the truth was that some of my criticisms of her last record Honest Life did feel a tad forced, as it was certainly a record intended to grow through the understated details and subtext, rely more on gorgeous vocal delivery and production to carry the deeper message - and I'll admit that in my headlong rush towards the end of the year, I probably didn't take it in as deeply as I'd prefer - and yet even with that her absolutely stunning track 'Only In My Mind' notched a well-deserved spot among my best songs of 2016, a late entry that was very well-deserved. Well, there are no such excuses for me this time around, and given how much critical acclaim this follow-up is receiving for fleshing out more of the lyrical details against arrangements I know are bound to sound terrific, I was really looking forward to giving this my full attention before both Linda Ortega and Kacey Musgraves sweep in to grab the spotlight in a few days. So what did I find on May Your Kindness Remain? Oh wow... I was not expecting this at all - of course I expected quality from Courtney Marie Andrews, but May Your Kindness Remain showcases the sort of ambition to expand and refine her sound beyond what you would typically expect in her brand of country folk, pulling on soul and even blues rock for a sound that's much more developed. And this was a gamble for her: I've heard a lot of indie country acts default to a sound that might seem bigger but plays to very comfortable vintage tones - this record doesn't do that, and when you couple it with a considerable step up in the quality of songwriting, she set a bar that'll be tough to challenge, and keep in mind we've already gotten great records from Courtney Patton and Caitlyn Smith this year! Of course, a huge part of this is Courtney Marie Andrews herself: she's got a great voice but it's taken a while for her to get the sort of production that can flatter it to the fullest extent. Sure, she can play for subtle and intimate on tunes like 'Took You Up' and 'Rough Around The Edges' - both of which are absolute standouts - but she can belt with the best of them, allowing her throatier tones to come through in a way that almost reminds me of Reba McEntire in the mid-to-late 80s, maybe not quite as fiery but leaning into soul and almost gospel touches on the title track and 'Long Road Back To You', where she has that weathered, lived-in character to her voice that just adds so much texture in the best way possible - these are songs lived, and even when she's writing from the perspective of, say, a desperate immigrant in the deserts of Arizona on 'Border', she can credibly sell that bone-deep exhaustion and deep-seated anger she knows she has to keep simmering below the surface. And hell, her delivery alone is what keeps a song like 'I've Hurt Worse' from questionable territory in the content - this is a song where she is clearly in love with someone who is at the very least neglectful and disrespectful and she seems with fine with it because hey, she's been hurt worse, almost contradicting her mother's advice that 'we love those who we think we deserve'. And let me stress, a song like this lives and dies on its delivery, especially when she doesn't tip her hand that she's unhappy in the lyrics, so to convey those deeper questions of self-worth and the healthiness of this relationship has to come from delivery alone, which necessarily adds ambiguity and it's amazing how layered her performance is here. So we might as well get into the content, and my big criticism of Honest Life was how the thematic narrative felt scattered and underwritten - and Courtney Marie Andrews has solved this in spades, because in terms of using the right words and poetic turns of phrase and detail, she nails so much of that lived-in, humanistic picture. Critics are already sketching comparisons to Joni Mitchell, and while I'd balk at that a little at that, I do hear some of it - both women approach the ambiguities of emotional relationships with a poise and maturity that lets the flaws ring through. For as much as this record is full of love songs, the larger underlying subtext is self-worth and the difficult questions and compromises many strong women make in its exploration. And it's a lonely record too, because it realizes the sad truth that said strength is often isolating - the title track is a great example of this, speaking to an old friend for whom Courtney Marie Andrews prays that good-hearted nature at her core will remain when more conventional strength bleeds away. Or take 'Lift The Lonely From My Heart', a very frank exploration of depression and how despite efforts to find oneself in a partner or a sense of wistful longings, to lift that loneliness it has to be driven from within. Or take 'Kindness of Strangers', where it can be so easy to be exploited or pulled away from a tough road you're walking, especially if you're trying not to be cynical, finding that kindness in others is often what keeps you going - and hell, when you look at 'Two Cold Nights In Buffalo', where she observes that decaying industrial city from her cheap motel, you wonder if that larger sense of indifference is what brought upon so much of that of decay, or at least exacerbated it. But then you get the love songs and the level of questioning, complicated subtext beneath them like 'Rough Around The Edges' and 'This House' and 'Long Road Back To You' and 'Took You Up' that show so much texture in the detail where the meaning isn't spoken aloud but you can clearly pick it up - I've seen comparisons to similar styles of writing coming from alt-country singer-songwriter titans like James McMurtry... and yeah, with these, Courtney Marie Andrews can match it. But what will stand out the most on this project is the production and sound, which does a tremendous job accentuating those lonely expanses without feeling oversold, mostly through the usage of electric guitar and organ to build thicker, smoky simmer that swells across a binaural mix that is amazingly well-balanced against sparse percussion and amazingly well-placed bass melodies. The tones are more ragged around the edges but they never feel suffocating or utilize the texture in a way that gets distracting - honestly, some of the mix placement reminded me a bit of post-rock, but if anything it's closer to the more atmospheric sides of folk and country that hasn't quite been explored all that well outside of acts like Casualties of Cool. But where that record was intentionally more acoustic and brittle in its space, there's a much greater sense of warmth that wells through the melodies - some of which, yes, can feel a tad familiar like on 'Took You Up', but never to the point where it's obtrusive. More importantly, it shows the sort of melodic balance that provides some supportive swell to cradle her voice but also give her the space she needs, from the fantastic piano holding 'Rough Around The Edges' against the more supple grooves, to the organ on the title track and 'This House', to the shuddering electric leads on 'Lift The Lonely From My Heart' and 'Took You Up'. And yet for as easy as it'd be for this record to just smolder in the atmosphere, there's a pulse and some tempo to accentuate the atmosphere, like the acoustic textures against the rich layering of 'I've Hurt Worse' where touches of accordion add to the misty tones, to that much more prominent lead guitar line driving 'Kindness Of Strangers' or the seedier side of 'Two Cold Nights In Buffalo' with the organ and bass interplay, or the outright blues stomp of 'Border' with the organ, fat bass groove and genuine snarl of the guitar and organ. This is a record that isn't afraid to infuse some genuine muscle into the compositions, and it's genuinely thrilling how well Courtney Marie Andrews can sell it. So as a whole... I keep trying to find apt comparison points for this sound and the closest I'm getting is what Miranda Lambert stretched over a double album on The Weight Of These Wings, but even that doesn't quite feel apt, as she used the space to accentuate her lack of place, whereas while Courtney Marie Andrews might take that dusty road alone, any place she walks she can make hers - plus, you know, a much tighter and refined release as a whole! And yeah, if any of the many comparisons I made got you excited, you need to hear this album yesterday and hope to God it doesn't get lost in the shuffle - and while I could nitpick a bit to say a few lines felt a tad clumsy or that I may have preferred a bit more bite overall, this is still one of the best album of 2018, netting a light 9/10 and absolutely a recommendation. Folks, just like her last record, May Your Kindness Remain will fly under the radar of entirely too many people, and you're not going to want to miss it - definitely get this one, you won't regret it! I have been using this replica watch, replica omega watchesit is a very beautiful and affordable automatic watch, good size, great quality, elegant and temperament, is my favorite style.replica omega de ville hour vision watches I shared this website with my friends and they were very happy.